Joe Todd-Stanton grew up in Brighton and was taught to draw by his mother, who is also an illustrator. He studied at Bristol University, receiving a first class degree in Illustration. Todd-Stanton’s tale is, at first glance, a deceptively simple tale of acceptance and bravery. However, he deftly infuses his narrative with quiet depth, including a positive ecological slant in which nature wins over machines, and portrays Erin’s single mother succeeding in a typically male-dominated profession. The illustrations are dazzling and vibrantly hued, the rich palette just right for the resplendent undersea scenes that adroitly float young readers’ sense of magic just under the surface of the mundane. A winner on many levels. The gentle environmental message takes on a kind of magic in Todd-Stanton’s pictures of Erin suspended in the ocean among incandescent jellyfish or facing down a monstrous, weaponised fishing fleet in the moonlight. A young artist to watch. A fairytale world is created that should enchant children as much as the old-fashioned illustrations that fit the story perfectly. The layers of ocean life and the benign Black Rock are beautifully rendered in this wonderfully tactile hardback, while the gently delivered environmental message adds a welcome real-life depth to the modern mythic tale. 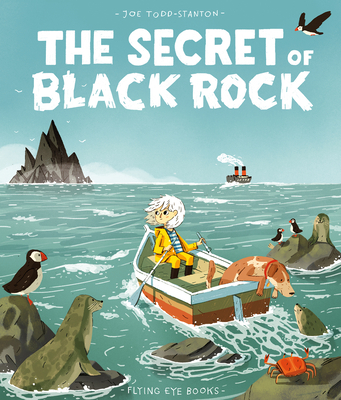 An original picture book story that is superbly illustrated from cover to cover, Joe Todd-Stanton's "The Secret of Black Rock" is a compelling and entertaining read for children ages 5 to 8, making it an extraordinary and highly recommended addition to family, elementary school, and community library collections. This is an exceptionally illustrated modern folk-tale […] You will love Erin and her large heart, courage, sense of adventure, and ability to stand up for what she believes in! This book is truly an amazing read! […] The illustration is magnificent!